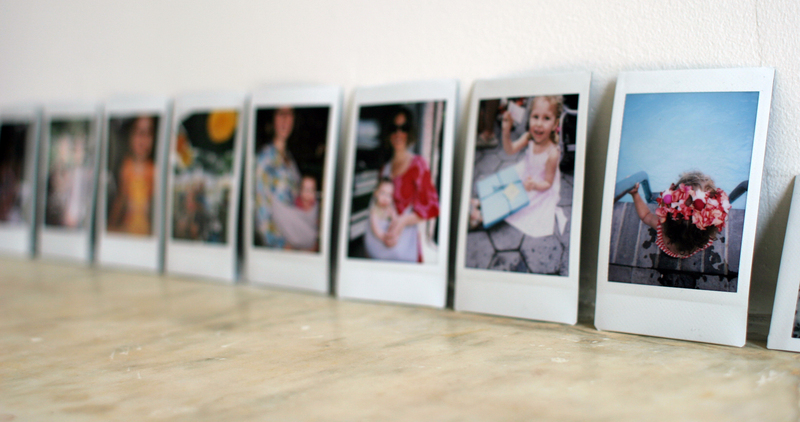 My heart was broken when I could no longer buy Polaroid film for a reasonable price. I love the colors and the magic of instant pictures. I love that they came with their own built-in frame and could be handed out to watch develop right in the middle of the action. My grandmother had a giant, noisy Polaroid that she used for family portraits. That camera seemed so out of place in her utilitarian household, but the images that it spat out flattened and tinted the setting into something beautiful. Thankfully I have a new love. This Fuji camera is itself adorable and the tiny photos are even cuter. (Thanks Japan!). A line of these pictures along a shelf makes a great installation of family photos- no frames required. Thank you! The projects keep me sane and I love seeing the amazing ideas that the kids come up with. Yummy blog!